For 7th - 12th grade students. Typically meets the 2nd Sunday of the month all year long. Meets next on Sunday, April 14th. Meets upstairs in the Youth room at 10:30 am to discuss mission work, events & activities. Everyone is welcome! Meets on the 2nd & 4th Sundays in September through May. Meets upstairs at 9 am during Worship. Youth Bible Study to dig deeper into His Word. Meets next on Sunday, April 14th. For students roughly age 12-14. A 2-year class that meets on the 1st, 3rd & 5th Sundays from September through May. Meets upstairs in the Youth Room at 10:30 am. Meets next on Sunday, March 31st. A spiritual, sacred and permanent sign that marks the Christian as a witness of Christ through the action of the Holy Spirit. 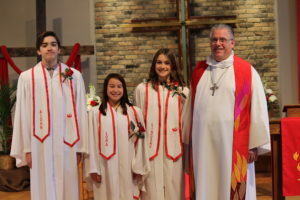 Our 2018 Confirmation Class graduated last year on Sunday, May 6, 2018. Congratulations to Aidan, Lora & Lindsay pictured below with Pastor Bob. Please click here for a detailed list of required work that needs to be completed in two (2) full years of Confirmation Class. Tuesday, Wednesday & Thursday, April 2nd, 3rd & 4th from 6 - 7:30 pm. A cooking class for kids with special needs, here at church. Please sign-up to help!